The Aalto University Executive MBA program in Taipei is a bilingual EMBA program, taught by international and local Taiwan faculty. The program is designed for individuals with significant professional work experience. Aalto University Executive Education (Aalto EE) provides high-quality executive education, professional development services and training supported by the competence of Aalto University. In Singapore Aalto EE operates under the name Aalto Executive Education Academy Pte Ltd. It is our mission to build a better world through better leadership. Each year, around 6,000 people from 1,000 companies benefit from our impactful, goal-oriented and comprehensive learning experience. We nurture and develop the knowledge and skills of individuals and foster self-confidence. We build individual learning paths and meaningful careers, as well as architectures for developing competence in entire organizations. You will also create the best business networks with us. Aalto University Executive Education Ltd is wholly owned by Aalto University, the leading university in Finland. With six schools, around 12,000 full-time degree students, and 4,000 staff members, it is one of Finland's largest universities. The university is named in honor of Mr. Alvar Aalto, the prominent Finnish architect, designer, and entrepreneur. Aalto’s achievements in technology, economics, and art exemplify the spirit of integrated knowledge which is the foundation of Aalto University. Through its cooperation with Aalto University, Aalto University Executive Education brings a multi-disciplinary approach and new, innovative learning methods to the development of experts and leaders. Aalto University Executive Education has two strongholds: our Helsinki office coordinates our operations in Europe, while Asia-Pacific operations are led from Singapore. In addition to Finland and Singapore, we offer our education programs in multiple locations worldwide. We aim to be the most wanted Nordic partner in supporting transformation in both private and public organizations, particularly in relation to growth and digitalization. We build a position as an established thought leader in selected Aalto University focus areas in chosen markets. Aalto University is a globally unique multi-disciplinary institution, where art and science meet technology and business. Furthermore, we will consolidate our position as the unrivalled number one leadership development institution in the Nordic countries in terms of reputation, scale, and scope. Our mission is to build a better world through better leadership. We want to be known for our impactful, goal oriented, and comprehensive learning experiences throughout an individual’s career, by being their preferred platform for lifelong learning. We guide individuals on their personal development journeys through curated content, identification of novel topic areas, and by providing a context for development of professional identity. In the context of lifelong learning, we focus on two main strategic areas: digitalizing learning and learning digitalization. In addition, a pivotal part of our vision is to make a solid and sustainable societal impact through the organizations and individuals we work with. The operations of Aalto University Executive Education Ltd provide a sizeable income to the university community in various forms such as dividends, tuition fees, and rents. In 2018, the financial footprint of Aalto University Executive Education in the Aalto community amounted to approximately EUR 3.7 million (EUR 3.1 million in 2017). Aalto University Executive Education Ltd is an internationally recognized executive education and leadership development organization. As a part of Aalto University we hold the 'Triple Crown' of accreditations, the three most respected business university accreditations, granted to only 0.5% of world's business schools: AACSB, AMBA and EQUIS. 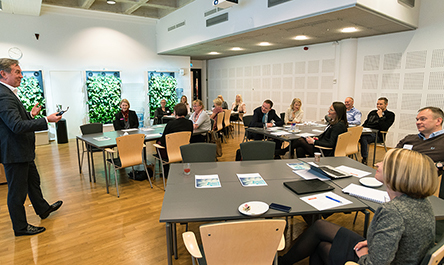 One of Aalto EE’s strengths is diverse international network through which we keep ourselves up to date on the latest international knowledge and trends: UNICON (The International University Consortium for Executive Education), EFMD (The European Foundation for Management Development), and PIM (Partnership in International Management). Aalto University School of Business is also a member of CEMS, a network united by the leading European universities and major companies. 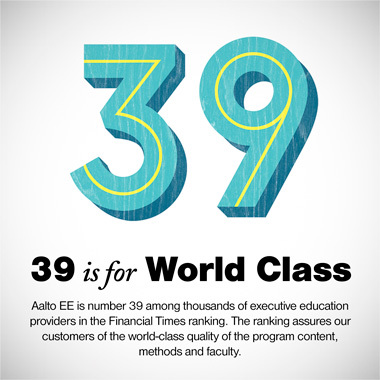 Aalto EE ranked 39th globally in the Financial Times Executive Education overall ranking in 2018, and therefore is within the top one percent of executive education providers in the world. The Financial Times ranking includes only the top 50 executive education providers. Globally, executive education and MBA programs are offered by around 4,000 institutes. In 2018, Aalto Executive MBA was again the only Finnish program to hold onto its place among the top 100 in the Financial Times’ annual global ranking. Aalto EE’s EMBA program ranks 46th in Europe and 93rd overall. Over 3,000 EMBA programs are currently being offered around the world, with only the top 100 making it onto the Financial Times' ranking.